The recent explosion of online cloud-based applications has widened the selection of easy-to-use, inexpensive, and even free online bookkeeping options for businesses of all sizes. However, wading through the features of each application in search of the perfect bookkeeping solution can be daunting if you don’t know what you are looking for. How many billable clients or customers does my business have, and how many total invoices will be generated monthly? What is my monthly bookkeeping budget? Is a cloud-based bookkeeping app the best option for me, or am I more comfortable with a downloadable option? Does my business require customer relationship management or time tracking for billing? Do I need invoicing options in more than one currency? Do I need an app that accepts payment by check, PayPal, direct deposit, and/or credit card? How many users (partners or staff members) need access to invoicing? Do I need customizable templates to include my company header, or is a preset template okay? Do I want a bookkeeping app that can be added to Google Docs? How comfortable am I with accounting and bookkeeping terminology? What other features do I require in an online bookkeeping app? When reviewing bookkeeping and accounting apps for your business, make note of those that most closely meet your requirements. If you can’t find the perfect invoicing or accounting package, look for one with add-on options, such as an option to increase the amount of users for an extra charge. Also, take into consideration your comfort with accounting. Some bookkeeping and accounting apps require familiarity with accounting and bookkeeping terminology, while others do not. In today’s global environment, the demand for multi-currency billing is increasing. These options suit businesses serving clients worldwide. Currently used in more than 56 countries, Kashoo allows multi-currency invoicing and immediately shows you the exchange rate impact. It can be integrated with Freshbooks. It offers bank reconciliation and claims to support all banks. 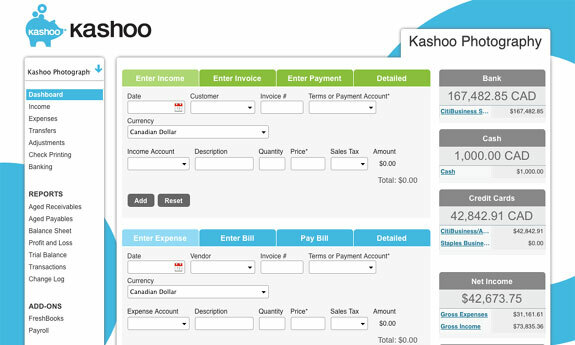 Kashoo supports over 100 currencies. It includes a check printing option. Users should be comfortable inputting financial information, and must have a basic grasp of bookkeeping terminology. As of early summer 2012, several customers report problems with print alignment on the check printing option. Free. The free version allows one user only. It includes invoicing, expense tracking, importing bank transactions, and an iPad application. Freelancer Package. This package costs $10 per month, allows three users, and features all the services of the free version. It also includes updated bank transactions from more than 5,000 banks worldwide, importing information from Freshbooks, and the choice of various invoicing templates. Small Business Plan. For $20 per month, the Small Business Plan allows 15 users, and it includes full payroll integration and multi-currency bookkeeping, in addition to all the features of the Freelancer Package. Based in India and growing by leaps and bounds, Invoicera is well-suited to businesses with global services and customers. If one of the packages doesn’t meet your business’s needs, paid add-on services provide further flexibility to customize the online bookkeeping package. A continuous free option is available for users with few clients and limited needs. 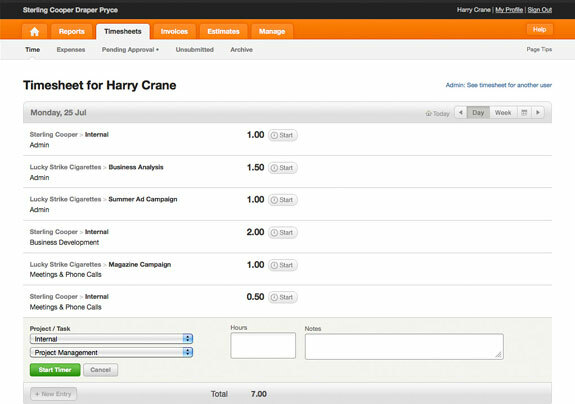 Invoicera users can choose a cloud-based invoicing platform or the self-hosting option. This appeals to small business owners who want a dedicated server on-site, as well as those who generate many invoices monthly and require extensive customization of invoicing due to government or country-specific compliance requirements. Currently supporting more than 120 different currencies, Invoicera offers invoices in 11 languages and 21 payment gateways. The 30-day free trial and free month-to-month plan do not require a credit card. Additional time tracking features are available. The poor grammar, incorrect use of words, and weak sentence structure on the website detract from the product. Their online chat appears to be continuously offline during business hours in the western hemisphere. It is difficult to find a help button on the homepage. Free. The free option includes unlimited invoices for 10 different products or services, three clients, and one recurring profile (meaning you can set up an automatic invoice for the same amount to one client recurring at set intervals). Basic Plan. The $9.95 Basic Plan increases the number of clients and recurring profiles to 15, and introduces the option of three auto-billing recurring profiles so you can automatically bill your customers’ credit cards and receive payment immediately. Invoicera’s Basic Plan also allows paid add-ons, so you can add extra features such as more clients, recurring profiles, auto-billing recurring profiles, and provide access to one or more of your staff members for an extra monthly cost. Classic Plan. The $19.95 Classic Plan increases the clients to 50, recurring profiles to 40, auto-billing to five, and gives access to two additional staff members. Business Plan. By purchasing the $39.95 Business Plan, you are allowed unlimited clients, 100 recurring profiles, 15 auto-billing clients, and access for five additional staff members. Infinite Plan. The $99.95 Infinite Plan includes unlimited invoices, services/products, clients, profiles, auto billing, and additional staff access. Xero is a detailed and comprehensive program geared to international small businesses or freelancers. Bank feeds mean you can import and categorize bank statements and credit card and PayPal information automatically, which is a huge time saver. Xero supports more than 160 currencies in their Large Plan. According to their website, Xero provides up-to-the-minute foreign exchange rates. 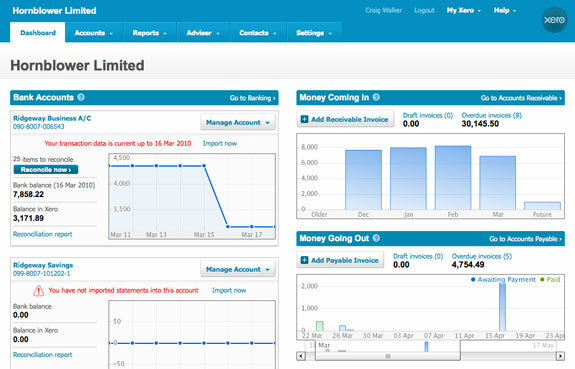 Xero offers a mobile-friendly interface. Xero advertises their free trial as being “free until you are ready to pay,” effectively providing an ongoing free version to customers. Most of Xero’s bank feeds are in beta and some have issues that could turn into major headaches for customers. Customers have reported that it takes a long time to figure out the cause of the problems and to get them reconciled. If you aren’t familiar with accounting and bookkeeping acronyms and phrases, Xero may be overwhelming. The three monthly pricing options of this New Zealand-based site appear in British pounds on the website, but can easily be converted to your required currency. Free Trial. For up to 180 days, you can get free access to up to five invoices and bank reconciliation of 50 items. You can cancel or upgrade to one of the paid options at any time. Small. The $19.99 Small Plan allows you to send and receive five invoices each month and reconcile 20 lines of bank statements. Medium. The $29.99 Medium Plan lets you send and receive more than 100 invoices each month and reconcile hundreds of bank transactions per week. Large. For $39.99, you can get the Large Plan, which adds a multi-currency option to the Medium package. The full-service online accounting apps provide accounting, bookkeeping, time management, and customer relationship management programs in a variety of packages. They suit larger businesses and those requiring more detailed and customized invoicing than most. Quickbooks also offers a downloadable option if you prefer a non-cloud-based system. The granddaddy of accounting software, Quickbooks Online has eight different products to choose from, including five online accounting packages. Quickbooks offers pretty much every accounting and bookkeeping option a business needs. Quickbooks Online runs on Windows or Mac operating systems. It allows imported data from Microsoft Excel spreadsheets. Quickbooks Online has a check printing option. It accepts credit cards for payment with a paid add-on feature. It can produce business trends reports. The Online Simple Start package lacks recurring billing, a time-saving and useful feature for freelancers with regular clients. Job estimates, and the ability to convert estimates to invoices, isn’t part of the Online Simple Start package, a feature often included in the competitors’ entry-level options. There are many forum and blog complaints about poor customer service. Small business owners can choose from Quickbooks Online’s five monthly packages. They all offer three-day free trials, and are all iPhone-, Blackberry-, and Android-friendly. The business reports include financial, tax, and sales information. Online Simple Start. The $12.95 Online Simple Start package allows one user access to more than 20 business reports, transaction downloads from one bank account, and one credit card account. Online Essentials. 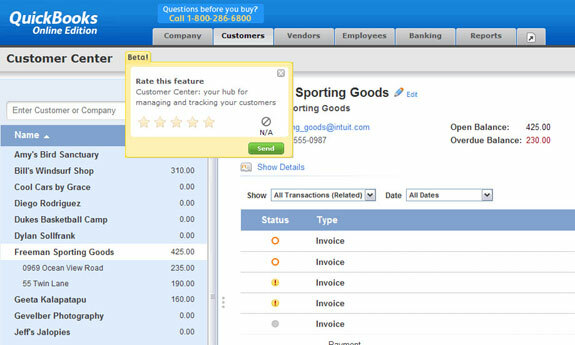 For $26.95, Online Essentials increases users to three with permission controls, access to more than 40 business reports, transaction downloads from unlimited bank accounts and credit cards, automated invoices, delayed billing estimates, bill creation and management, reports on industry trends, and company snapshot information. Online Plus. The $39.95 Online Plus package allows five users, access to more than 65 business reports, and all the features of Online Essentials – plus billing by your customer, creating and sending purchase orders, inventory tracking, class tracking, budgeting and planning, and tracking multiple locations. It also includes tools for managing employees, such as time tracking and preparing and printing 1099 tax forms. Online Essentials With Payroll. Costing $52.76 each month, this is the Online Essentials package that allows access to 55 business reports, and includes payroll features such as automatic calculation of federal and state taxes, unlimited monthly payrolls, and the ability to create, approve, and direct deposit or print paychecks. Online Plus With Payroll. For $63.16 per month, you get Online Plus With Payroll, which provides access to more than 80 business reports and the same payroll features as the Online Essentials With Payroll package. 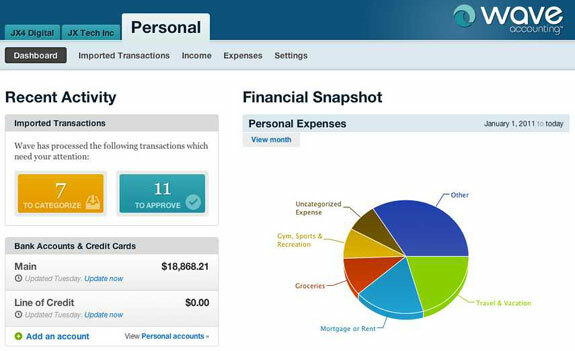 Canada-based Freshbooks is a comprehensive bookkeeping and time tracking system with more than five million users as of September 2012. See our Freshbooks Review for more information. Freshbooks has an attractive website and simple layout, which results in a pleasant and easy-to-use interface. It is now available as a mobile app for iPhones. As of September 2012, Freshbooks supports payments in 50 currencies and accepts payments via PayPal, credit card, and direct deposit. Freshbooks offers collaboration and team management tools. Its fast and helpful customer support personnel are easily available via phone or email. 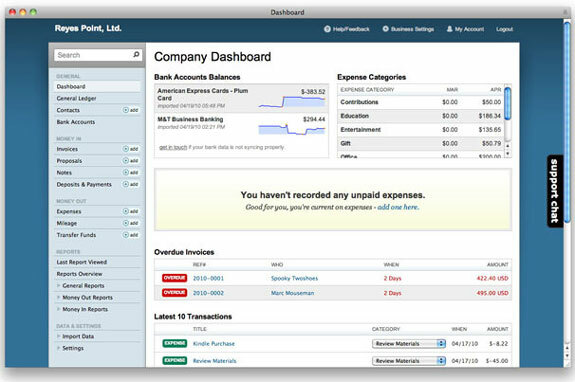 Users can track expenses, time, and billing. 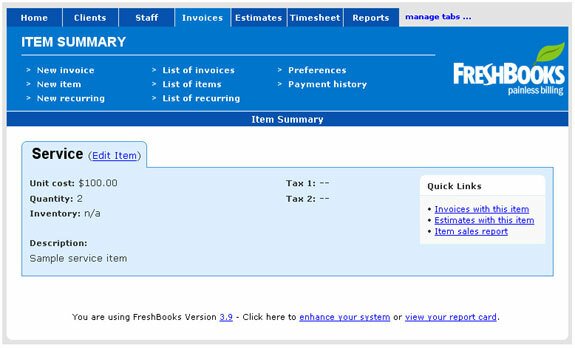 Freshbooks allows you to see when clients view and pay invoices. There is a free option if you have three or fewer clients. It is difficult to find the monthly costs of the packages without actually signing up. Freshbooks users report expense category problems, such as items being slotted into incorrect categories. The second-tier package is expensive compared to Freshbooks’ competitors. Free. The free version of Freshbooks allows users to work with up to three clients for invoicing, time tracking, expenses, and estimates. Seedling. The Seedling package costs $19.95 per month and gives users access to 25 clients, as well as unlimited accounts receivable invoices and contractors that can time-track invoice you (accounts payable). Evergreen. The $29.95 Evergreen plan includes features of the Seedling account with unlimited clients. Mighty Oak. The $39.95 Mighty Oak plan allows one additional staff member to access your account and benefits larger teams with time sheets, project management finance tracking, and team expense reporting. Often, home-based business owners or small business enterprises don’t need all the features of a full accounting application. They require basic invoicing features and just one or two extras, such as time tracking or customer relationship management features. 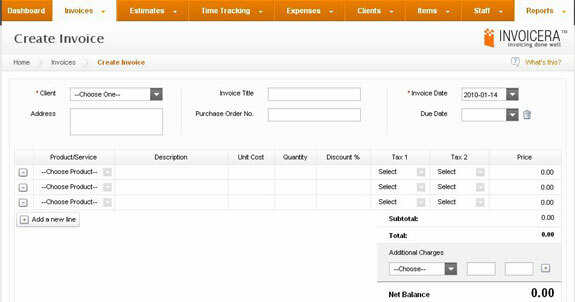 Harvest features time tracking with online invoicing as a secondary offering. This bookkeeping and time tracking app is both iPhone- and Android-compatible. It supports Google apps integration. Harvest supports uploading data to Excel and Quickbooks. This is a nice feature if you want to take care of monthly invoicing yourself while providing the data your accountant will need at the end of the year. It is more expensive than the competitors for the services offered. It doesn’t have customizable templates. Solo Plan. This plan costs $10 per month for one user, and additional users can be added for $10 each. The plan includes unlimited clients, invoicing, and projects. Basic Plan. For $40, the Basic Plan allows five users and adds time sheet approval to the Solo Plan. Business Plan. The $90 Business Plan allows unlimited users in addition to everything offered by the Basic Plan. 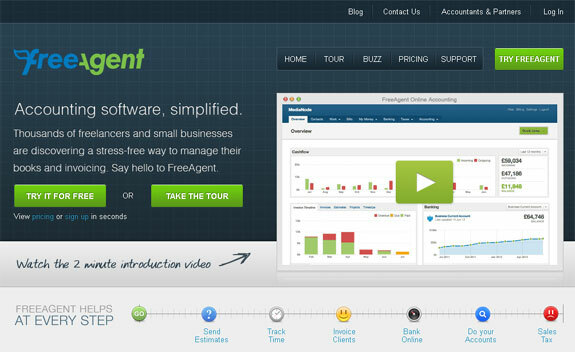 An award-winning cloud-based software package, FreeAgent comes with several neat bookkeeping bells and whistles. It offers tons of information and report-generating tools for business owners to choose from. FreeAgent won Vendor of the Year at the 2011 Software Satisfaction Awards. It has an easy-to-navigate user interface with a large, central search bar. The well-organized tabbed information makes it easy to find exactly what you need. Good value for the money compared to its competitors. The selection of tools and reporting options may overwhelm small business owners and freelancers who don’t already have a firm grasp of bookkeeping. Though advertising a universal tax selection for international customers, the tax features are set for the United Kingdom. Customers elsewhere must complete their own tax filing and forecasting. FreeAgent is different from its peers in that it only offers one plan. For $24 each month, you get unlimited invoicing, users, clients, projects, estimates, and bank accounts. The plan also includes time tracking, expense tracking, account reports, data backup, and security. Yendo offers a solid CRM system and is good for salespeople who want pipeline tracking. Yendo works well on mobile handheld devices and smartphones. It offers robust accounting and CRM tools for small businesses and home-based businesses. Users can create exportable reports in a PDF format. The interface may actually be too simple, as it can be difficult to locate specific transactions when users need to find previous items. Solo. The Solo plan costs $9 per month for one user and one client only. It includes unlimited invoices, bookkeeping, CRM, branded invoices, contact imports, and invoices. Standard. For $26, you can upgrade to the Standard plan which allows five users, five clients, and budgeting and forecasting features, plus everything included in the Solo option. Premium. The $52 Premium plan includes unlimited users and 10 clients, and adds developer application programming interface (API) to the Standard features. LessAccounting boldly proclaims its goal of reducing your bookkeeping duties to once per month right on its website. While this might not be possible, it does include some excellent features for customer management and banking. 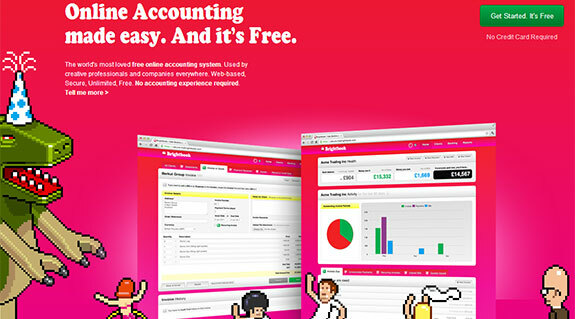 LessAccounting offers an entertaining and engaging user interface. Its “Handy Comparison Tools” allows you to compare LessAccounting to Quickbooks, Outright, Xero, and Freshbooks to help select the best option for your needs. It is fully integrated with your banking information. Small business owners can import contacts from various address books to set up a customer contact and customer relationship management system. Time tracking seems to be missing from LessAccounting, but there is a separate app at LessTimeSpent.com that is fully integrated with LessAccounting (free for anyone with a paid account). Customers have complained of glitches in the banking integration system. The only payment gateway for LessAccounting appears to be PayPal. There isn’t a help button on the homepage, but customer service is available weekdays 9am to 6pm EST. There is also email, chat, and forum support available. A seven-day free trial is offered, while many competitors offer a 30-day free trial. For $30 per month, you get unlimited users and unlimited transactions. According to the FAQ, the options to upgrade accounts are only accessible once you sign up. You can record and categorize transactions, and send and manage invoicing. While many online accounting and bookkeeping applications offer a 30-day free trial, or in some cases a basic free monthly option, these apps are completely free. A Toronto-based firm, Wave Accounting targets home-based businesses, work-at-home moms, freelancers, real estate agents, and other small businesses with few staff members. Wave Accounting provides a full suite of double-entry accounting features such as journal entries, balance sheets, a general ledger, and income statements. You can connect or upload bank statements, credit card bills, and receipts through integration with Shoeboxed. Wave Accounting is always evolving with continuous improvements and frequent upgrades. Users can access special offers and business deals. It is missing an audit trail, which means more work for you and your accountant should you be audited. Users complain it only lets you correct one item, and that they can’t go back to correct previous transactions. This makes it difficult to fix things when you make a mistake. As of September 2012, you cannot reconcile bank statements to Wave Accounting, though, according to the site, there are plans to offer this in the future. Another completely free app, Brightbook has a really bright homepage. If you don’t like red, orange, and pink, stay away. Otherwise, it may be a perfect invoicing solution for you. Brightbook provides unlimited invoicing for users. You can customize invoices by uploading your business logo. It offers fast and easy quote-to-invoice conversion. Multi-currency invoicing is also available. Users may add tax or discounts to an invoice with just one click. Brightbook has limited functionality. This is not a full-service accounting package, but rather a basic invoicing app. It has a very limited selection of basic accounting reports, such as income and expense reports. It does not offer profit and loss statements. Life can be a lot easier for small business owners who use online accounting services. The advent of cloud computing and rise of “software as a service” (SaaS) means you don’t have to buy expensive software, download it to your computer, and purchase expensive upgrades. There are many online resources and accounting tools for freelancers and small business owners, and you can choose from products from a free, bare-bones invoicing app, to a more complex system offering integration with bank information and a myriad of project and time management options. Remember, technology and software change quickly, especially cloud-based software, so be sure to visit the vendor sites directly to get the most current information before choosing the best one for your business. And don’t feel overwhelmed by the choices. Decide what features you absolutely must have, identify your budget, and spend some time researching your options. Which online bookkeeping option do you use? Do you recommend it?